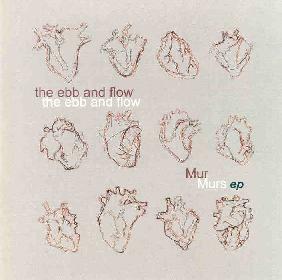 The Ebb And Flow - "MurMurs EP"
The Ebb and the Flow is a three piece band of Sara Cassetti on drums, Sam Tsitrin on guitars and vocals and Roshy Kheshti on moogs, farfisa, melodica, vibes and vocals. The band invited several guests including Dmitry Ishenko on bass and Jeff Jacobs on trumpet and Ralph Carney on sax. The opening track, "4 Track Mind Dusty Crickets", features some really excellent playing from the guests. The track begins to sound like Skin to Skin from Sweden but quickly changes. "Murmur in Fa" has a really cool synth drone that the rest of the song builds upon. Roshy sings this song, while Sam (female) sings the first track. The lyrics are quite amusing on this number as well. "Me And My Twins" is a very upbeat song compared to the first two songs but none less quirky. "Throop" is an instrumental number again featuring the excellent guests. "Contra Verse" ends this really cool EP. I hope I can hear more by the band! A cool mixture of jazzy stuff, weird rock and a touch of pop, but just a touch! The band is working on or has finished their next album and is playing around the San Francisco Bay area. Check them out. For more information you can visit The Ebb And Flow web site at: http://www.theebbandflow.net.